In late March, we made the difficult decision to rehome one of our Old English Sheepdog puppies. We had enthusiastically and ambitiously chosen to embrace littermates -- brother and sister -- last July when they were seven-weeks-old. In hindsight, a precious, educational, and exhausting experience. With sadness, regret, and feeling defeated, my family and I unanimously waved the white flag after eight months. Taking on two puppies was more work than we had anticipated. In the end, we simply didn't have the time -- even collectively -- to care for each dog properly. Birdie, the high-energy, intelligent female required a lot of physical and mental exercise. She also dominated our 8-year-old son, Redmond. Her eyes locked on him when he entered a room, and she frequently lunged and grabbed his arm with her mouth when he walked near her, sometimes with a growl (not a vicious bite, but the potential for disaster was there, especially as she grew larger). Redmond was an Inspector Clouseau to Birdie's Cato Fong, minus the manservant part. A trainer tried to help Redmond and Birdie redefine their relationship. Things improved, but we still needed to remain hyper-vigilant when Birdie -- who now outweighed Redmond -- was in the same space as our youngest boy. Again, we don't believe she was an aggressive dog, but she was the boss of Redmond, and he was afraid of her. John, Birdie's larger, low-energy, not-so-bright brother, was easier to manage. It appeared he was trained because he often sat when we said, "Sit." I maintain it was, and remains, a coincidence. He likes to sit more than he likes to move. The two dogs together weren't twice the work; they were ten times the work especially as they grew. Focused on each other and desiring to play ALL THE TIME, our home often resembled a post-party fraternity house. Our hardwood floors look like we gave the kids butter knifes and said, "Draw!" We decided that if we were going to whittle our pack by one, Birdie was the one to go. Big dumb John would be easy to care for and he didn't try to dominate anyone. A local business that we had used for training and dog daycare agreed to assist us. They're not a shelter, but have occasionally helped families like us. Birdie went to a familiar facility with caring people she had known for months. She was comfortable, played with other dogs, and received more training. The owner and head trainer personally interviewed potential adopters. It took a month, but Birdie was finally rehomed with a young couple. I'm told they have no other pets, no children, are active, and most importantly, that they fell instantly in love with Birdie. We miss our girl, but are shifting the angsty energy to love and attention for John. He seems happy and unfazed. Happy and UnfazedAs I struggled through the process, crying frequently, feeling guilty, losing sleep, etc., an experienced dog trainer advised me to stop applying human psychology to dogs. She said that, yes, some dogs are more sensitive and grieve a rehoming, but that Birdie adapted seamlessly (not exactly sure how people know for certain what an animal is experiencing, but I digress). Birdie's strong, independent, bouncy personality, combined with her healthy young age, comforted me. She would be fine. So, we sadly say farewell to Birdie, knowing we did the right thing for her and our family, and thankful that she landed in the arms of a couple who feel like they hit the lottery. And as I type this, I look at John -- 100 pounds of stupid and handsome -- lying on the floor beside me, and I say, "Get off my foot, John." The following also appears on the American Fork Citizen site, directly beneath the "From the Editor's Desk" column, and titled "The Last Word." 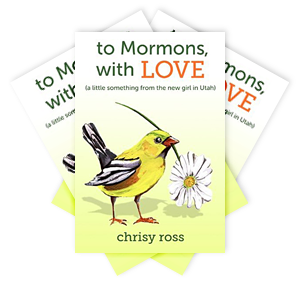 My book, to Mormons, with LOVE, continues to enable me to participate in many discussions. Topic specifics vary but conversation always centers on religious and cultural differences. People enjoy sharing their experiences and stories; and questioning me further about mine. Often, I’m asked, “What do you believe?” Great. Holy Spirit? Higher Self? Does it matter? I’m a runner, although recently more of a hiker due to a neck injury. My running and hiking friends attend church on Sunday, so I embrace the time alone. My summer Sunday mornings are like the opening scene from Oklahoma. People walk to church, smile brightly and wave to me as I run by. The sky is blue, perfume and aftershave fill the air, and scriptures are reverently carried. “Oh, What a Beautiful Mornin’” plays in my head. I think it plays in everyone else’s head, too. Winter is different. The skies are often grey; families are in cars, sometimes taking a corner on two wheels because they’re running late. (We’ve learned to avoid driving lessons for our student driver beginning five minutes before church starts through about 45 minutes after.) However, I still always get a smile and a wave, even if it’s a little rushed. Recently, friends and I have been hiking near our home. Sundays, when I head up solo, I climb, talk to God, and give thanks. I’m thankful for a body that allows me to move, the deer that seem unbothered by my presence, and the overwhelming sense of peace that I feel. When I arrive at the top of the hill, I sometimes make small snow angels with my feet. I like to think there are angels and spirits all around me on that hill. Some familiar, most not, but I welcome them all. I always pause to take in the view. I look at my town, knowing that in the churches I see (there are many), my friends, and people I don’t know, are worshipping. And praying. For me, for you, for themselves. And I graciously receive. …I believe in God. And, I believe that God believes in ALL of us. Mary, our beloved Miniature Schnauzer, died in March. We knew we'd eventually get another dog, but Chris and I told our sons it was important to grieve Mary. We assured the boys that this summer -- after a few trips and events that required our full attention -- we would get a puppy. Probably. We hit the promised sweet spot. Boys wanted a large breed; my stipulation was a non-shedder. Our research led us to the decision to add an Old English Sheepdog to our family. I insisted on a female because leg-lifters and humpers are worse (in my mind) than shedders...or reptiles. A beautiful female was available mid to late summer, exactly when we were. A puppy seeker in California was interested in her, too (so the breeder told me). We needed to make a decision fast. One other pup was still available in the litter -- a male -- described as "chill" and "laid-back." I asked if something was wrong with him. Was he skittish? The breeder said no. I'm not sure how the holes of the Swiss cheese lined up, but somehow Chris and I decided we were open to purchasing both puppies. "Let's ask the boys," I said to Chris. "They're pragmatic. Maybe two puppies won't appeal to them." Earlier in the summer, Duke (13YO) transitioned to an insulin pump to manage his diabetes. With the support and encouragement of his older brother, Parke (15YO) -- who uses the same pump, Duke quickly adapted. He loves it. No more shots (or very rarely), and much easier to enjoy food spontaneously. Both boys had diabetes-related routine blood work done, as well. We were informed while on vacation in Arizona in early July, that a celiac disease screening came back elevated for Duke. Biopsies of his stomach and small intestine were completed within a few days of our return to Utah. Duke was asleep for the procedure. They went through his mouth to get the tissues, so other than a sore throat and anesthesia recovery, he felt fine the next day. Results took close to two weeks. A couple of days after receiving our precious puppies, we received news that our precious Duke was diagnosed with celiac disease. We cried, but not for long. The tears were less about saying farewell to conventional pizza, pancakes, and cupcakes, but more about the fact that there's one more thing Duke must manage...for life. But again, we wiped our eyes and blew our noses, found a couple of outstanding gluten-free bakeries, and celebrated the fact that there are many delicious, nutritious foods that aren't glutinous. And, the fact that there are worse diagnoses. So, here we are. Puppies, John and Birdie (nickname for Elizabeth), are more joy and work than we imagined. Their energy, size, and innocent personalities have captured the focus and hearts of our entire family. The five of us feel victorious and fulfilled after a day caring for the brother and sister sheepdogs. We're united...and distracted. Life is so much more than pizza and cupcakes. While searching for and eliminating hidden gluten, I left the refrigerator door open as I read labels. Birdie helped. We felt happy.